Looking nondescript and nothing amazing, Khao Ka Moo absolutely does not taste the way it looks. The pork leg is simmered for hours in trance-inducing gravy peeling away the fats and making it so tender that it literally melts in your mouth. A generous helping is piled on top of your rice, with that sinfully indulgent sauce poured over it, paired with a hot and sour spicy chilli, this is the bomb. 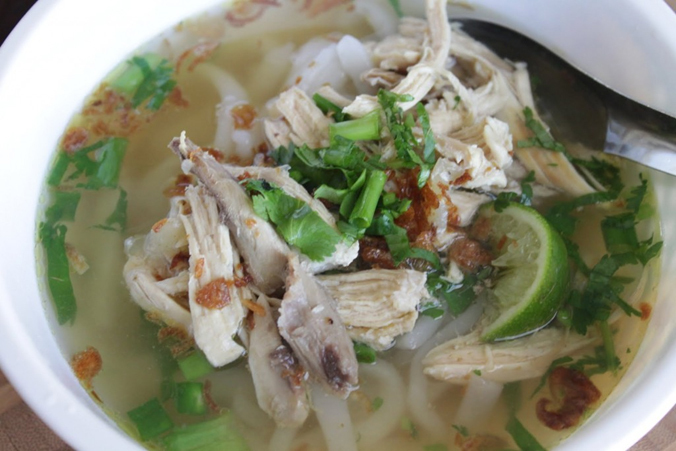 This interesting Lao noodles actually make use of sticky rice noodles. 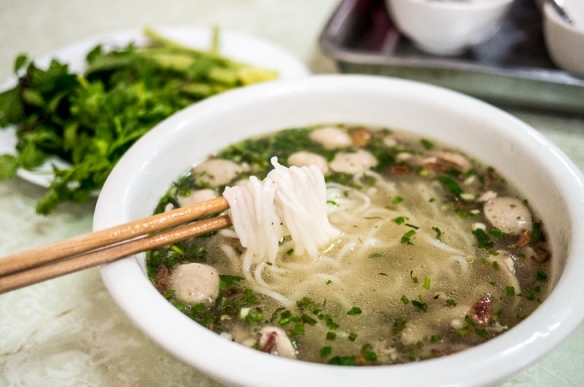 By virtue of its base ingredient, the texture is absolutely different from any other noodle soup in the region. It’s slightly sticky, slippery and very refreshing. Most people are pleasantly surprised after eating it for the first time. Like other noodle soups, the broth always packs a punch seemingly boiled to perfection with tons of chickens simmering in a giant clay pot vat. There are many versions of this everywhere around town, the difference in each version being the topping. The fried pork belly one is a personal favorite, the beef one is a heartwarming option for a cold morning, and there are also chicken and vegetable variations. 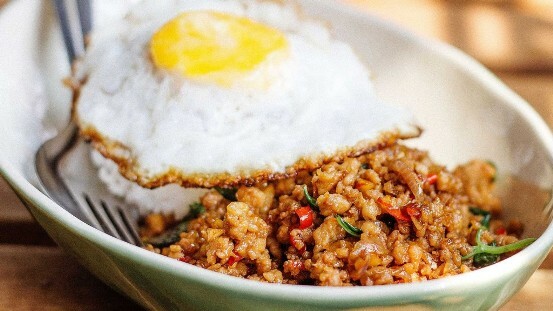 Pad Ka Pao Paa is basically fried basil with fish or pork. That smell of spices, the lingering smoky flavor of the wok is what makes this dish epic. This is the mainstay of people in Luang Prabang, they eat sticky rice all day all night long. And for more basic meals, they literally eat it only with chow bong (Buffalo skin chilli). This is the summer elixir. You’ll see it in glass display cases all over the local side of town. Just go to one of these glass displays, point at whatever you want, and it will be topped with a mountain of crushed ice and condensed milk. 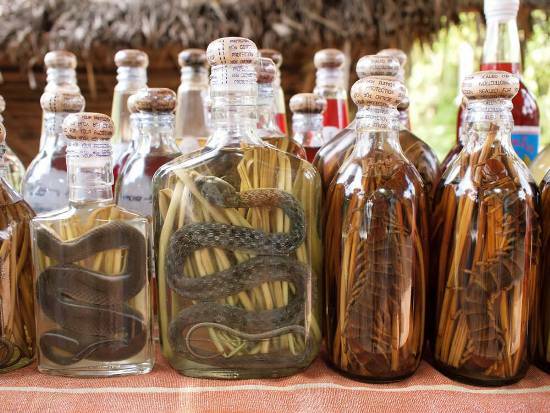 Lao Hai & Laolao are 2 most famous sorts of local wine that you can’t miss in Luang Prabang. Both are made from stick rice, but in different ways. Laolao is the more famous one and everyone knows about it. You can visit the Laolao or whisky village on the way to the Pak Ou Caves. This is a clear distilled rice alcohol that is very flavorful. Lao Hai is the lesser known counterpart, but it is a way more superior experience to some travelers. Made by the Kamu people, Lao Hai wine is made by fermenting sticky rice together with the husks in jars. The taste is much thicker, more flavorful and you can literally feel the sticky rice fields swaying in your mouth. The way you drink Lao Hai is even more interesting. Because of the husks and rice still being present in the jar, you have to utilize these long bamboo straws that will be cut on the spot by a local farmer that prevents them from going up the tube. And you have to add cold water into the jar to generate the liquid. The fun part of it is adding beer lao instead of water. A little fizz added to the flavor of the rice wine is an epic experience in itself. Coupled with sitting down together with a farmer in the backyard of his house drinking from the same jar, it’s an experience you will never forget. A typical Laos food, which can be found on every street corner in Luang Prabang. You can fill it with tomatoes, carrot, cheese, and pork meat topped with chili sauce. Further choices can be chicken, avocado and bacon. 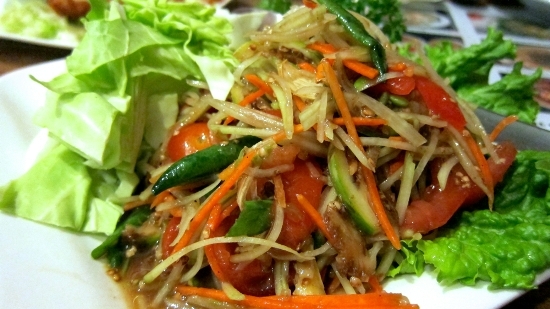 The green Papaya salad is made from shredded papaya. The dish includes five main ingredients, which are mixed with hot chili, sour lime, salt, fish sauce and sugar. You should try once when traveling to Luang Prabang, Laos.